I am back here finally !! But can't promise if, I will post as often as I used to, but will try to once a week at least. 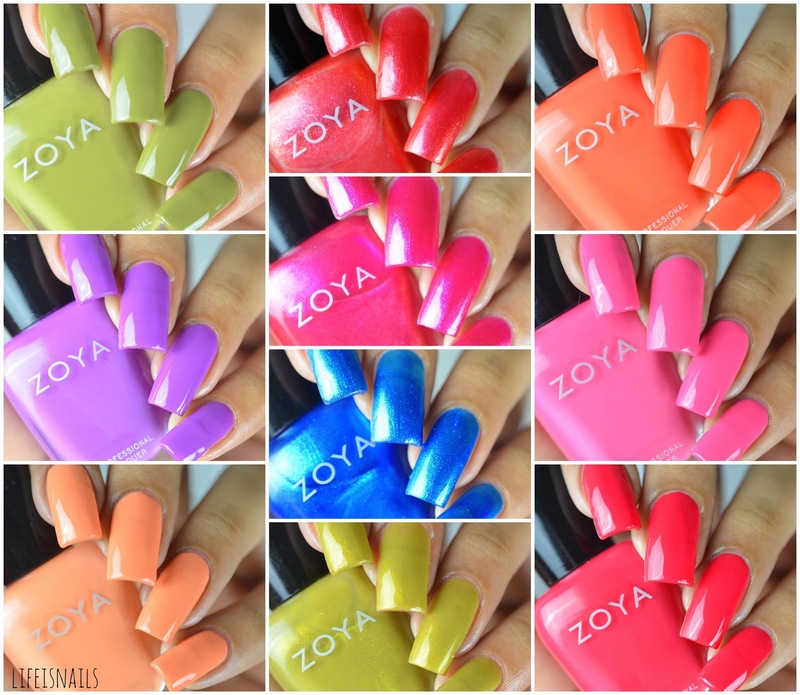 Today I have swatches of Zoya Wanderlust Summer 2017 collection(minus 2 cremes as they broke in transit) to share with you. Formula : To be very honest, I never find any formula issue with any Zoya polish, I don't know maybe its because they are new when I swatch them, or I don't know, but I always am happy with the formula of Zoya Polishes, they are like this dreamy, buttery formula which everyone loves. ARBOR: A beautiful olive green creme. Shown here are 2 coats plus top coat. CORA: A stunning orange creme with a coral tone in it. Shown here are 2 coats plus top coat. LOIS: A gorgeous violet creme. Shown here are 2 coats plus top coat. WINNIE: A lovely watermelon pink creme. Shown here are 2 coats plus top coat. SAWYER: A pastel orange creme. Shown here are 2 coats plus top coat. SONJA: A pink toned bright red creme. Shown here are 2 coats plus top coat. SCOUT: A stunning mix of olive green and mustard yellow with golden shimmer. Shown here are 2 coats plus top coat. RIVER: A vibrant cobalt blue shimmer with a pinkish shift in it, although the shift is visible only in the bottle and not on the nail, still love this color. Shown here are 2 coats plus top coat. MANDY: A stunning berry pink with pink to gold shimmer in it. Shown here are 2 coats plus top coat. JOURNEY: An orangish red base with gold shimmer in it. Shown here are 2 coats plus top coat. Overall Review: The vibrancy of the colors is what screams summer to me, these are not some regular summer colors, but with the variation of colors makes this a perfect summer collection.